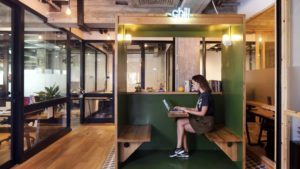 There’re so many reasons why you could look for next coworking space‎ in NYC, because your team is growing, because your office isn’t big enough or simply because you’re a remote worker. It’s true that working out of a collaborative workspace is a great way to work within a community close to your home when you’re in need a flex-office, could it a great idea if you work for an early stage startup or if simply you’re a marketing professional, developer, gig-worker and freelance. Co-working spaces are also a great option in NYC for independent employees. All these coworking spaces have great amenities such as high speed wi-fi, lounge, complimentary hot beverages, printing and scanning for a flat daily price about $30 in New York City. You will find amazing coworking spaces in Midtown Manhattan, as well as in Upper West Side, Lower East, Flatiron and many more others neighborhoods in Manhattan in New York City. At Beewake, we only offer affordable and cool coworking space in New York City. Talking about New York City, and with close proximity to Penn Station, Grand Central Station, we offer the most unique and coolest coworking spaces perfect when you need to work for a couple of hours and the entire day. And the great thing with Beewake is that you don’t need any membership, you just purchase a daypass for a coworking, and when you’re on the go, just fire up the Beewake app available on both iOS and Android and unlock your city’s best coworking spaces. With Beewake, you’re guaranteed to find a workspace nearby whether you need to work from WeWork, the Yard, the Workhouse, Voyager, Bond Collective, Rise NYC and many other prestigious New York City coworking spaces and off course affordable coworking space nyc. No need to be buy any membership with Beewake with Beewake, whether you’re entrepreneurs, creatives and innovators, just come be productive work in NYC and Brooklyn with Beewake and find a flexible workspace in New York City, . Finally, a couple of days ago, we celebrated Flex Day Celebration, it’s one of the most important for us at Beewake because freelancers can find Coworking Space in Manhattan or also Manhattan Office Space. National Flex Day is designed to encourage employers and employees to offer more flexibility at work and flexible work options.